I have a problem. I see potential. I see a closed-down building… or a piece of old furniture sitting streetside in front of someone’s house… or a delapidated house… and I see potential. I see what used to be and also what could be. And it’s a problem because I have neither the time nor the finances (nor all the skills necessary) to transform all those things I see into what they could be once more. But God can make every transformation! 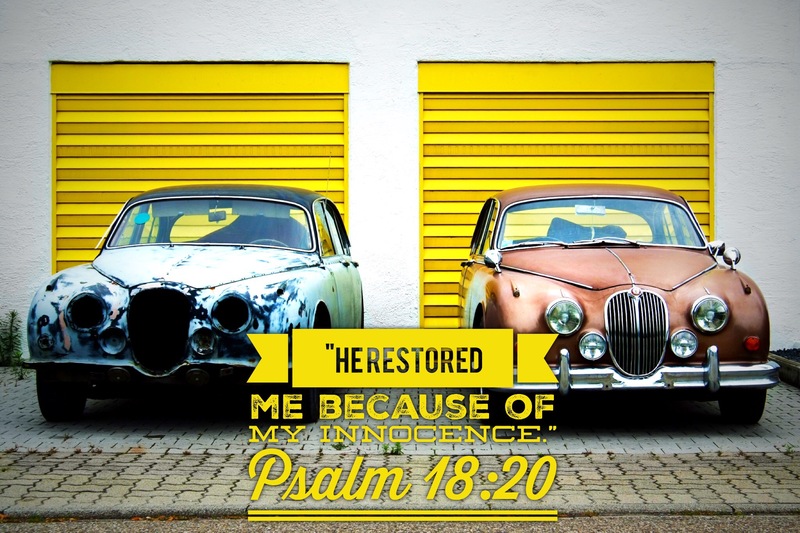 We may have gone through a tough time… a significant life-challenge… a distressing situation, but God can not only rescue us out of that difficulty, He can restore us to usefulness and beauty once more. When we go through a distressing time in life, but we keep a right attitude and call out to God, He flies to our rescue… He speaks to us to encourage and comfort us… He reaches down to pull us out of it… He rescues us out of sheer delight… and then He rewards us… and then He recreates us so that we can get back to life! When we are going through these challenging times, we tend to think that if we even make it out of it, we might be so wounded or so tired or so broken that we won’t be able to go on. But God steps in, restores us and makes us productive for life once more. You may be beat up and broken down, but God knows how to fix what’s wrong and make you better than new! So perfect and so true! !